Three new interviews with author C.A.A. Savastano on a wide range of intelligence figures and those connected to political assassination cases. Midnight Writer News: C.A.A. Savastano returns to discuss five notable figures in the JFK case with your host S.T. Patrick. Tune in to hear the tangled, nefarious, and unlikely allegations that surround certain figures in the case. The Ochelli Effect: Join Mike Swanson, C.A.A. 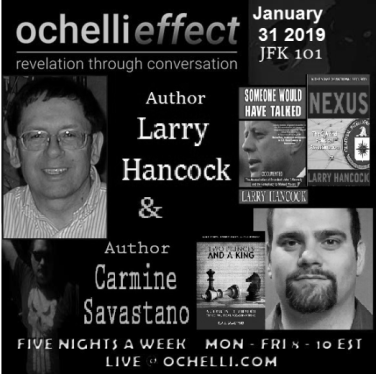 Savastano, and your host Chuck Ochelli to discuss the life and influence of a largely unknown CIA operator during the Cold War named Leo Cherne. The Past American Century: A discussion about evidence and one long asserted myth related to the JFK case with author Carmine Savastano and historian Mike Swanson. Who were Mr. and Mrs. Oswald?